LIPOMED is currently transitioning to new labels featuring an innovative transfer part. Please see our flyer for more information. 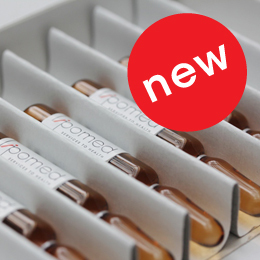 LIPOMED announces the availability of its new product line of AQUEOUS ETHANOL STANDARDS. LIPOMED has developed this line to support laboratories looking for high quality and reliable aqueous ethanol standards used in the calibration of analytical techniques for quantitative analysis of ethanol. LIPOMED AG, Switzerland is GMP, GDP and ISO 9001 certified for production and distribution of Pharmaceuticals and ISO 17025 accredited for testing of Analytical Reference Standards and ISO 17034 accredited for Reference Material production. All products distributed by LIPOMED affiliates are manufactured by LIPOMED AG and distributed under protocols of LIPOMED AG. If you are interested in receiving our newsletter to receive updates on new products, please send us an e-mail to webmail@lipomed.com. The newsletter is published on a regular basis in english, french and german.